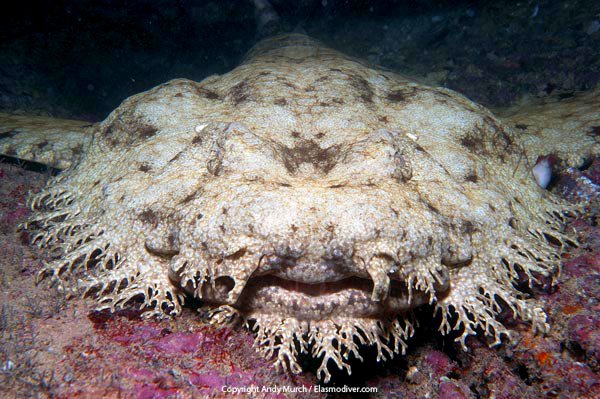 Today I want to write about an amazing sea creature, the tasselled wobbegong. These strange looking fish can grow up to 1.8 metres long. Tasselled wobbegongs are ambush predators, waiting on the sea floor at night for small fish, crabs, squid or cuttlefish to come past. They also use their tails and the growths around their mouth to lure potential prey. Females give birth to about 20 live pups at a time and the babies measure about 20 cm long. Tasselled wobbegongs are found in the coral reefs of Indonesia, Papua New Guinea and northern Australia. They are considered near threatened due to damage to reefs and pollution. Are there any other interesting facts that you would like to share about tasselled wobbegongs?